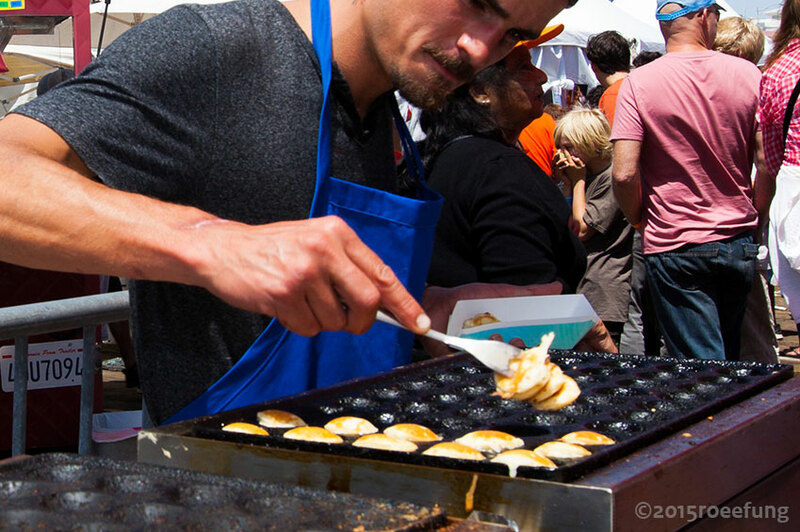 Have you ever heard of poffertjes, the mini pancakes from the Netherlands? Its size might be small, but its influence has been great. This little sweet treat from the Netherlands has relatives in Indonesia. 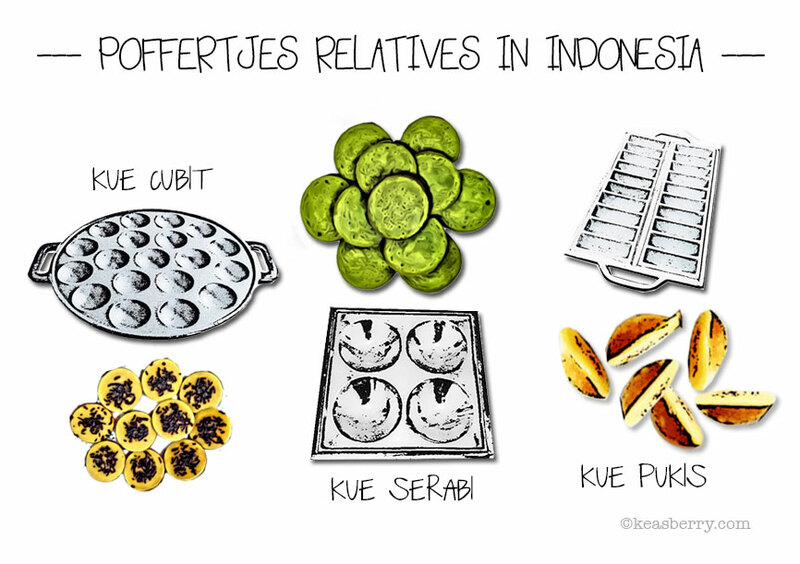 Traces of its culinary DNA can be found in sweet Indonesian treats like kue cubit, kue cerabi and kue pukis. Indonesian cuisine is known for being diverse. Many regional cooking styles exist, often based upon indigenous culture, religion and foreign influences. The Dutch were in Indonesia for more than 300 years. This led to the adoption of European cooking styles, ingredients and dishes into Indonesian culinary. Some foods are known to have inherited the taste of the Dutch. it is said that poffertjes (aka broedertjes) date back to 1720, were initially developed by French monks near the city of Woerden in the Netherlands, during the French revolution. until today poffertjes are a popular sweet treat often served at festive occasions like carnivals (kermis), fairs and Christmas markets in the Netherlands. These fluffy mini pancakes are served with powdered sugar and a tablespoon of real butter. the recipe can be found at the bottom of this article. Its Indonesian cousin is kue cubit; a small pancake with similar dimensions as poffertjes at 1.6 inches (4 cm) in diameter. The steel plate with several small round shallow basins resembles the Dutch poffertjes pan. Ingredients include flour, baking powder, egg, vanilla sugar and milk. Popular topping is chocolate sprinkles (hagelslag). the cake is called cubit, meaning pinch in Indonesian, because of its small size. To eat it one has to pinch it. Another relative comes from Solo and Bandung on the island of Java. Kue serabi is somewhat larger than the kue cubit at 4 inches (10 cm) in diameter. The batter is made from a mixture of rice or wheat flour, coconut milk and sugar. Sometimes pandan juice is added to the batter for aroma and green color. Often cooked in a small earthenware (clay pot) frying pan on charcoal fire. covered with a lid. Alternatively a metal pan with 4 moulds is used. Toppings vary from grated coconut flesh, ground peanuts, chocolate sprinkles to golden brown coconut sugar syrup sometimes creamed with coconut milk to more modern versions using chocolate, strawberry syrup and even grated cheddar cheese, corned beef or shredded chicken. This relative is farthest removed and leans more towards a cake or waffle. The mixture consists of egg, granulated sugar, flour, yeast and coconut milk. The batter is poured into a half-moon mold and baked on fire. The top is yellow and the bottom is browned. Toppings vary from chocolate sprinkles, cheese, pineapple jam to sukade – small pieces of candied fruit like papaya. My advice: use an original cast iron or non-stick poffertjes pan. Click here. Put flour, buckwheat flour, salt and sugar in a bowl and mix with a whisk. Add the yeast (for the puffiness). Then add the milk slowly while stirring until all the milk has been added. Mix everything until the milk is completely absorbed. Add the eggs and mix (with handblender) until you have a smooth batter without lumps. Cover the bowl with the batter with plastic wrap and leave it at room temperature for about 60 minutes. Pour the batter into a squeeze bottle. Heat the pan on medium flame. Put butter in all the shallow indentations with a pastry brush. Pout the batter into it. Bake the poffertjes until the bottom starts to turn brown and the batter starts to ‘dry’ from above. Then turn them around with a skewer or fork. If the poffertjes are baking too fast, lower the heat. When the poffertjes are golden brown on both sides, they are ready. Remove the poffertjes from the pan and place them on a plate. Sprinkle the poffertjes generously with powdered/icing sugar and add a tablespoon of real butter on top. Poffertjes are best when served warm. Enjoy! PS: you might see a resemblance with the Danish sweet treat called Aebleskiver. These puffy fried cakes are bigger and more round shaped like ping pong balls.